The paving materials you select and the size of your patio are the main factors in determining price. 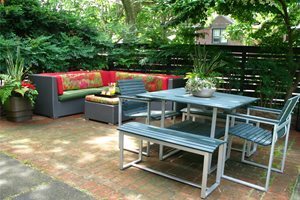 Depending on these, the cost of a patio can range from $800 to $4,000 plus. 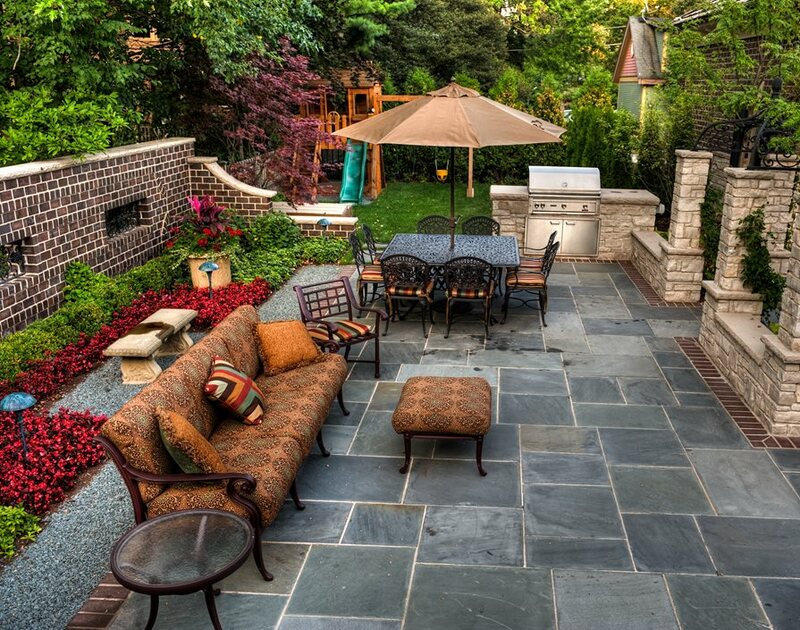 Paving your patio will likely be your biggest landscaping expense. Concrete is typically the lowest cost option, while stone is the most expensive option. However, costs can vary considerably within each material category. A basic concrete patio will cost around six dollars a square foot, while stamped and colored concrete can cost nearly twenty dollars a square foot. Similarly, a sandstone patio will cost less than bluestone or travertine. 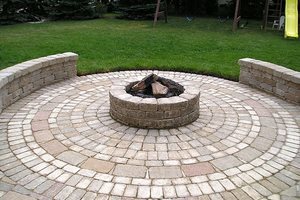 Creating a patio of bricks is simple because these standard units are all the same size and shape. 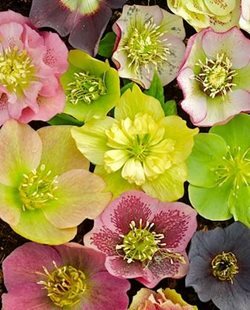 But the popular flagstone patios which are incredibly beautiful are also the most demanding. Every piece of naturally irregular flagstone must be assessed by the mason for size, shape and thickness, then these must be fine tuned to create the beautiful patchwork paving. Any time a material can be obtained from local sources, the cost is lower. Because building materials are so heavy, they are costly to truck over long distances from manufacturing plant or quarry to the project location. One of the strong sustainable building practices is to strive for locally originated materials to reduce shipping costs and other add-ons due to interstate commerce. 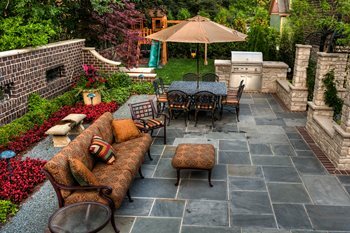 Pro Tip: If paving your entire patio with stone is too costly, opt for a concrete patio accented with stone borders or bands. Another factor that will impact the cost of a patio is the intricacy of the design. If your patio is going to have lots of curves or a complicated paving pattern expect to pay considerably more. This price increase is due to the additional time and effort it will take to install the patio. Anytime a contractor has to make special cuts or spend time laying pavers in an exact pattern the labor costs are going to go up. Yet another issue that can increase patio cost is preparing the soil that will support it. If the subgrade is not prepared properly your new patio could settle and crack. It is well worth paying extra to ensure that your patio is being installed on firm ground that won't shift or wash away. 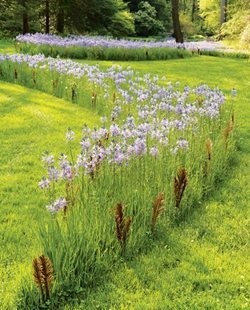 Typically the soil will need to be compacted and any drainage issues will need to be remedied. If you plan to have a dry laid stone or paver patio then a layer of gravel and sand will need to be compacted over the existing soil. In northern regions, soils freeze in winter. 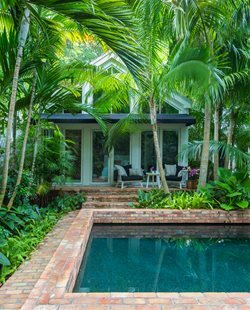 For these locations it is essential that the foundations for the patio extend well below the frost line if they are to remain stable throughout the spring when freeze-thaw causes soils to heave. Each microclimate will have it's own designated frost depth recognized by the building department. This establishes the minimum depth of the setting bed for a patio, which demands the entire space be dug out and aggregates of different sizes shipped to the site to install in layers. The deeper the cut, the more layers the higher the cost. 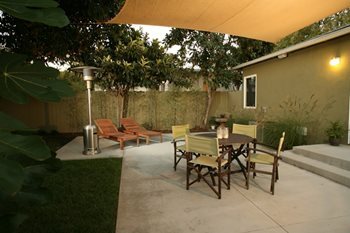 Look at having a patio installed as an investment similar to a bathroom remodel. It will increase the value of your home and quality of your life. 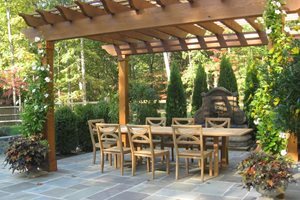 Just like you would for an interior job, get multiple estimates for your patio. Compare the costs and the quality of the installers before hiring a contractor.